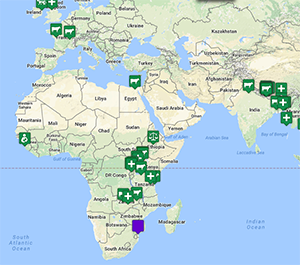 Whether a student's goal is to work hands-on in the field, or negotiate policy change at the international level, our goal is to help students develop the knowledge, skills and agency they need to be competitive and effective as international veterinarians. To develop a level of knowledge and proficiency in general international veterinary topics equivalent to a mid-level junior professional. To develop a skillset in an area of specialization equivalent to an upper-level junior professional. To have a basic understanding and command of the skills required to work as an effective member of a multi-cultural, multi-disciplinary team.